This quick and easy Instant Pot Mexican Chicken Stew is slightly spicy, super hearty and filling. Just what you need on a chilly winter night. Ok guys, I am officially obsessed with my Instant Pot. I’ve made rice, stocks, tried several different blogger recipes along with some experiments and I’m hooked. This was my first major success with my own recipe but it posed a dilemma. Sometimes a recipe comes along that tastes totally delicious but looks completely meh. This is one of those recipes and I really debated about if I should share it. But at the end of the day, it was just too tasty to not tell you all about it. I think the pops of green from the cilantro really help make it look more appealing. This stew is packed with delicious, good for you ingredients that will keep you full for hours and hours. 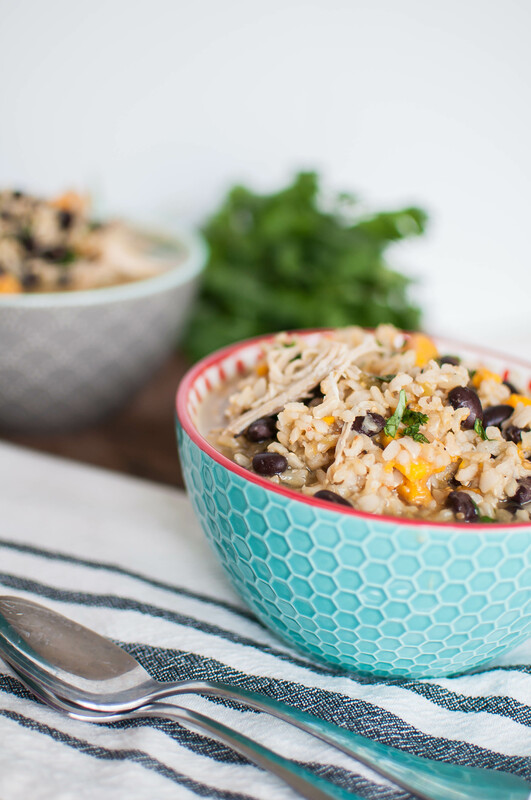 Along with tender chicken, brown rice, black beans and sweet potatoes provide the hearty factor. Chicken stock and roasted salsa verde bring some crazy good flavor. Because everything is cooked together in one pot, the depth of flavor is really intensified and enhanced. I’m not normally the kind of person that can eat the same thing several days in a row but I happily ate this for lunch four days straight. If that doesn’t scream success, I don’t know what does. I also threw several portions into the freezer for a busy weeknight or simple lunch. I’ll report back on how well it froze after we eat it. If you don’t own an Instant Pot or pressure cooker, you could easily make this in a slow cooker on low for 8 hours or high for 4 to 5 hours. The only thing I would do differently is cook the rice separately on the stove and add it to the stew right before serving. I’ve never looked forward to cold weather in my life but I’m watching the forecast for the next super chilly night so I can make another big batch. Instant Pot Mexican Chicken Stew is a snap to make in just 20 minutes. It's warming, hearty and spicy. Filled with chicken, beans, rice, sweet potatoes. Turn instant pot on saute mode. Add avocado oil and onions. Saute for 1 minute then add the salt, grated garlic and cumin. Cook another 2 to 3 minutes, until softened and golden. Turn saute mode off. Add sweet potato, chicken, brown rice, chicken stock and salsa verde to the Instant Pot and stir to combine. Lock lid then turn set to cook on manual for 20 minutes. Allow the pressure to release naturally for ten minutes then move valve to release the rest of the pressure. Remove the chicken to a cutting board and shred, being careful not to burn yourself. Add chicken back to the soup along with the drained, rinsed black beans.